Glucose metersÂ come in a variety of sizes and with as many different features. Some let you track and print out your test results, while others have audio and larger screens to help people who have vision problems. Some require a smaller blood sample than others; some have spoken results. And though most can be purchased in your local drugstore, not all are covered by your insurance. Your meter should fit your lifestyle and your needs, so talk with your physician about the options. Read the directions for the meter and the test strips before using them. Wash your hands before testingÂ your blood sugar. Food or juice on your fingers could affect the results of your blood sugar reading. Be sure to wash the area from where you’ll draw blood, too. 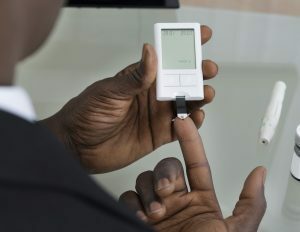 Most diabetic glucose meters instruct you to prick your finger for a sample, but some meters let you draw your sample from your palm, arm, thigh or calf. Use the right test strip for your meter. The meter may give you the wrong results if you use the wrong test strip. Write down your results and the date and time you tested. Do this even if your meter keeps track of your numbers. Take the results with you when you go to your doctor.